We have a ubuntu server. 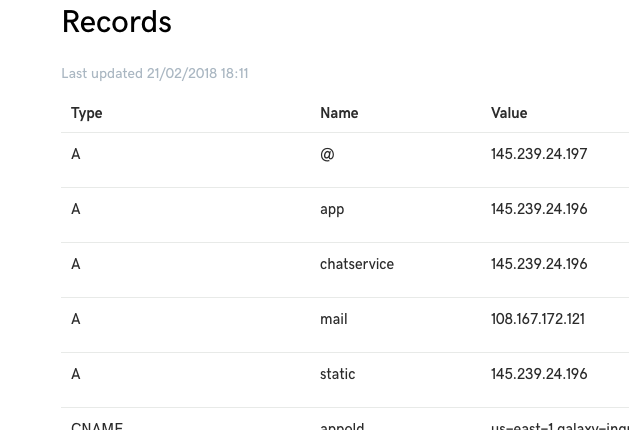 I build my meteor app and run it with pm2. Recently I have a strange behavior concerning the url I put my app on. However in my app inside server I have a redirect from/ route to /login. And that redirect happens. On the other hand if I go to my app by the public ip http://217.182.200.46:3001 it just works great! So I am not even sure why is this problem happening. Because of the app or some server configs? Here are the dns configs from godaddy. As you can see the root points to a different ip than the subdomain. On 145.239.24.196 I have nginx server.chatservice.backtocart.co is on nginx as well however it works fine I get nginx response. I tried to put the app on this domain as well. There I just get a blank page from meteor. any error message logged in /var/log/nginx/error.log? 2018/04/25 13:05:10 [alert] 5627#5627: *1 write() to "/var/log/nginx/access.log" failed (28: No space left on device) while logging request, client: 83.26.242.86, server: app.backtocart.co, request: "GET /websocket HTTP/1.1", upstream: "http://127.0.0.1:3000/websocket", host: "app.backtocart.co"
2018/04/25 13:05:10 [error] 5627#5627: *3 connect() failed (111: Connection refused) while connecting to upstream, client: 64.213.69.2, server: app.backtocart.co, request: "GET /websocket HTTP/1.1", upstream: "http://[::1]:3000/websocket", host: "app.backtocart.co"
2018/04/25 13:05:18 [crit] 5627#5627: *32 pwritev() "/var/lib/nginx/proxy/1/00/0000000001" failed (28: No space left on device) while reading upstream, client: 185.44.229.105, server: app.backtocart.co, request: "GET /dashboard HTTP/1.1", upstream: "http://127.0.0.1:3000/dashboard", host: "app.backtocart.co"
2018/04/25 13:05:21 [crit] 5627#5627: *50 pwritev() "/var/lib/nginx/proxy/2/00/0000000002" failed (28: No space left on device) while reading upstream, client: 185.44.229.105, server: app.backtocart.co, request: "GET /dashboard HTTP/1.1", upstream: "http://127.0.0.1:3000/dashboard", host: "app.backtocart.co"
2018/04/25 13:05:21 [error] 5627#5627: *54 connect() failed (111: Connection refused) while connecting to upstream, client: 24.20.120.197, server: app.backtocart.co, request: "GET /websocket HTTP/1.1", upstream: "http://[::1]:3000/websocket", host: "app.backtocart.co"
2018/04/25 13:05:23 [crit] 5627#5627: *53 pwritev() "/var/lib/nginx/proxy/3/00/0000000003" failed (28: No space left on device) while reading upstream, client: 185.44.229.105, server: app.backtocart.co, request: "GET /dashboard HTTP/1.1", upstream: "http://127.0.0.1:3000/dashboard", host: "app.backtocart.co"
2018/04/25 13:05:32 [error] 5627#5627: *77 connect() failed (111: Connection refused) while connecting to upstream, client: 141.136.91.12, server: app.backtocart.co, request: "POST /createNewVisit HTTP/1.1", upstream: "http://[::1]:3000/createNewVisit", host: "app.backtocart.co", referrer: "https://www.incredo.co/contact"
2018/04/25 13:06:01 [error] 5627#5627: *89 connect() failed (111: Connection refused) while connecting to upstream, client: 141.136.91.12, server: app.backtocart.co, request: "POST /setDisconnectedAt HTTP/1.1", upstream: "http://[::1]:3000/setDisconnectedAt", host: "app.backtocart.co", referrer: "https://www.incredo.co/"
2018/04/25 13:06:21 [alert] 5627#5627: *90 write() to "/var/log/nginx/access.log" failed (28: No space left on device) while logging request, client: 141.136.91.12, server: app.backtocart.co, request: "OPTIONS /createNewVisit HTTP/1.1", upstream: "http://127.0.0.1:3000/createNewVisit", host: "app.backtocart.co"
2018/04/25 13:06:21 [error] 5627#5627: *89 connect() failed (111: Connection refused) while connecting to upstream, client: 141.136.91.12, server: app.backtocart.co, request: "OPTIONS /getProjectIdByUrl HTTP/1.1", upstream: "http://[::1]:3000/getProjectIdByUrl", host: "app.backtocart.co"
2018/04/25 13:06:40 [crit] 5627#5627: *141 pwritev() "/var/lib/nginx/proxy/4/00/0000000004" failed (28: No space left on device) while reading upstream, client: 185.44.229.105, server: app.backtocart.co, request: "GET /login HTTP/1.1", upstream: "http://127.0.0.1:3000/login", host: "app.backtocart.co"
2018/04/25 13:06:40 [crit] 5627#5627: *142 pwritev() "/var/lib/nginx/proxy/5/00/0000000005" failed (28: No space left on device) while reading upstream, client: 185.44.229.105, server: app.backtocart.co, request: "GET /login HTTP/1.1", upstream: "http://127.0.0.1:3000/login", host: "app.backtocart.co"
It seems the server is out of disk space? But I am not sure what all the numbers mean. Does root seems to be full but I still have 183GB free on disk? So yes, the problem was that there was no available space on root. Clearing up space on root solved the issue.